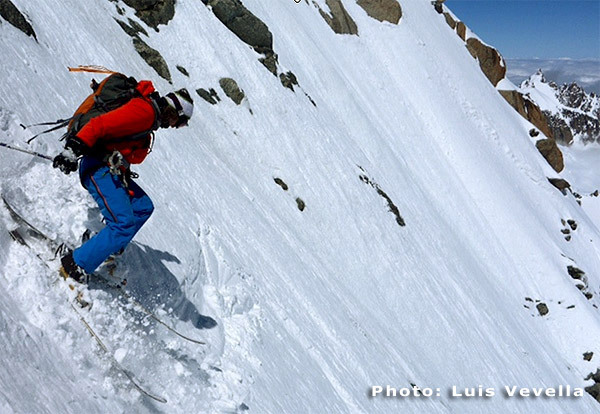 Avalanches present the major hazard for skiers venturing into the mountains in winter. The eventuality to get caught in an avalanche reduces significantly with an attentive study of the ascend and descend line of the tour, which needs to be chosen as safe as possible, also considering the absence of an obvious hazard. In case of being buried in an avalanche the chance of survival depends drastically on the rapidness of recovery. For a person buried under one meter of snow, the chances of survival are indeed 80% in the moment of the incident, but get reduced to 40% after an hour, to 20% after two hours and to 10% after three hours. An indispensible precaution therefore is to be equipped with a transceiver (ARTVA), which every participant should wear under the jacket or pullover at about chest height and set at transmission at the moment of leaving. This way the transceiver emits signals, which can be heart in the phase of reception and will lead the researchers to the point, where the victim is buried under the snow. To recover the victim a snow shovel and a probe ( there exist as well sticks which can be used as probe) are then necessary. Equipment which needs to be part of the collective material of the group. The descend in fresh powder represents the most fun and rewarding part of the tour. You should however approach it with the necessary precaution for not turning a moment of fun in a tragic occasion. It is not only essential that you choose tours adapted to your personal technical skills, but also and foremost possess the knowledge to valuate the hazards linked to an avalanche.